A lightweight bout between Tony Ferguson and Anthony Pettis is being reported for UFC 229. MMAJunkie.com reported the match-up, which is set for Oct. 6 inside the T-Mobile Arena in Las Vegas, Nevada. If the report holds true, then it adds some more beef to UFC 229’s main card which will be headlined by a lightweight title bout between champion Khabib Nurmagomedov and Conor McGregor. Ferguson was scheduled to take on Nurmagomedov to determine the undisputed UFC lightweight champion back in April. The bout would’ve headlined UFC 223. “El Cucuy” tore ligaments in his knee and was forced off the card. He’s been out of action since Oct. 2017, but he recently revealed he’s been cleared to compete. As for Pettis, he returned to form in his last outing against Michael Chiesa. The former UFC lightweight title holder submitted Chiesa in the second round at UFC 225 back in June. It was “Showtime’s” first win in a year. While he’s gone 3-5 in his last eight fights, Pettis feels he has gotten back to his roots. A win over Ferguson would certainly solidify that claim and would catapult Pettis back to title contention. Booking another lightweight bout between two respected 155-pounders could prove to be a win for the UFC no matter what. If Nurmagomedov or McGregor were to pull out of the main event, then you have Ferguson or Pettis to fill in. If the headliner remains intact, then you have a lightweight bout that most expect to be a barn burner. Stick with MMA News for the latest info on UFC 229 including any additions and potential changes. You can count on us to deliver live coverage of the event from the prelims to the main card on fight night. 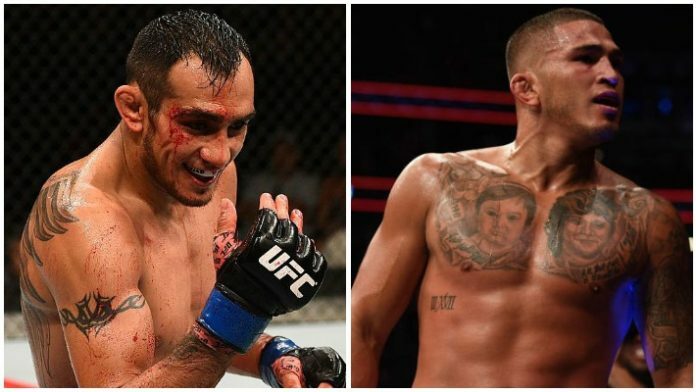 Do you think the match-up between Tony Ferguson and Anthony Pettis was the right call for UFC 229?